The New R series of pedals from JOYO are the 4th generation of guitar effects by JOYO Technology and will be released in the late part of 2018. We have been busy trying out the prototypes and have put together a brief outline of what is on the horizon. In total 11 new products are about to feature in the new pedal line up, a gradual release is planned and we are very excited to bring you news of what pedals will become available over the coming months for distribution in the UK. Whilst some details may change, all the R pedals feature a similar metal housing, a unique Led shell design and an impressive range of versatile tone bending options. 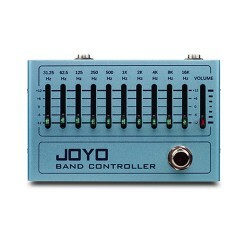 Here is what we can tell you so far about the New Pedals coming from JOYO. Whilst we do not have the exact release dates, we are now privately playing on the pre-production models and writing more details. its a hard job, but someone has to do it. 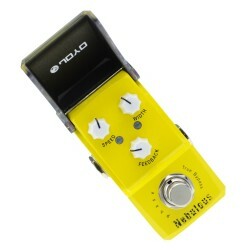 Classic Wah 1 - The classic wah pedal features both wah wah and volume functions. In Wah / volume mode you can adjust the volume sensitivity to meet your requirements, by pass the wah to activate the wah. The Wah gives classic controls, down for treble, back off for bass. The pedal features RM shielding, a Green Led when active, metal housing and has a space saving footprint of 16cm x 6cm. Not too small, just right! Multifunction Wah 2 - Not only do you wait for a wah pedal from JOYO, but then 2 come along at once. The wah 2 has the features of Wah 1 classic, but features a Q value knob, adjusting the wah centre frequencies. A Q controls the resonance of the mid range of the wah, turn up for a high Q results in a high Quack, scale back the Q, a low quack. Adjusting the EQ mid with the Q control adjusts the steepness of the slope, the higher the slope increases the mids in the wah sound. The overall frequency range can be adjusted further with the Q selector, giving you a very versatile range in the Wah Quack Frequency (that’s a technical term we just invented). R-01 Tauren Overdrive - The Tauren are a race of large, bovine humanoids who dwell on the great plains of Central Kalimdor, that’s if you play world of warcraft. Here on the great plains of JOYO UK the Tauren is the first in the R series of new pedals from JOYO. The pedal produces a warm transparent overdrive that adds dynamic gain to the signal without altering the tone of the guitar. Volume, Gain and Tone controls are all you need here, you will rely on it, it’s the sound of an dynamic overdriven tube amp in a box. R-02 Taichi Overdrive - Perhaps with a little more compression that the Tauren, a little more sustain, four knobs control the overall volume, gain, tone and voicing of the pedal. At lower settings, the pedal achieves extremely light overdrive sounds reminiscent of tube amps set low, remaining warm and smooth. With higher settings, the Taichi increases in gain and sustain, edging on low distortion tones retaining the warmth. The pedal achieves a great combination of saturated tone whilst retaining the open harmonics of your playing. R-03 Uzi Distortion – Taking it to the next level, The Uzi introduces some classic British overdriven guitar amplifier tones, taking it from smooth break up to that intense edge of sustain metal distortion. The Uzi is a distortion pedal with great sonic flexibility and will represent a classic overdriven amp through to a very responsive aggressive grungey distortion. R-04 Zip Amp Compressor/Overdrive - Danger Danger this pedal should come with a warning. If you are a lover of Instrumental rock, Hard rock & Glam metal this is the pedal for you. You have the ability to choose between standard compression and even more compression resulting in balanced but very powerful overdriven tones. R-05 Maximum Overdrive – If you are after the full tonal range of an overdriven amp then you cant get better than taking it to the maximum. We could have called it the Ultimate 2. From smooth & crunchy vintage overdriven tones to producing immense distortion sustained tones, this pedal delivers it all. Definitely a pedal for those who are obsessed about Rolling stones, Pearl Jam, Cream. It’s an amazing all rounder from vintage to modern, this pedal dials it all in. R-06 O.M.B Looper/Drum Machine – A looper and a drum machine in one ! 1.In L+D mode, it will synchronise the recorded loop to the selected drum groove. With the options of Pop, Rock, Blues, Metal, Punk, Jazz and Latin with upto 12 bar beat. Use it as a stand alone looper, use it as a synced drum machine with tap tempo will make this a favourite for sole performers and for practice sessions. Who needs a drummer anyway. R-07 - Aquarius Delay/Looper – A looper and a delay pedal in one ! 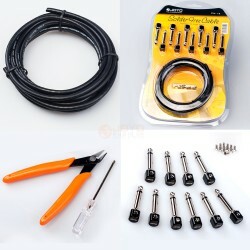 8 different delays to select from here from Digital, Analog, Tape Echo, Tube Echo, Reverse, Lo bit, Galaxy & Modulated. Turn on the looper and the delay and loop are combined & synced. R-08 Cab Box Cab Sim & Ir Loader – It’s the ultimate Amp Simulator pedal & DI, forget carrying your amp with you, or mic’ing up your cab, just grab the cab box. A big screen, lots of knobs, easy to use, more jacks such like midi, DI output, ear phones output, thru output (for loop or stereo). With lots of preset cabs to select from you have a huge sound at your finger tips, hook it up to your favourite overdrive pedal and you are good to go. R-09 XVI Octave – With a control for sub octave and upper octave adjustment this is going to be one popular pedal on the board. Polyphonic with a dry and mod mix is going to allow the dirt to get lower and the clean to get higher. An octave pedal will add character and open up your tone to a totally new dimension. ...and so far thats about all we can leak for now about these new sonic weapons for your arsenal, more details, prices, pictures & demos will surely follow. Oh and we know there are at least 7 more to come.. If you fancy trying them out in person, please visit the JOYO booth at Music China in Shanghai, the JOYO booth is Hall W4, B52 from October 10th to 13th.. After that date, we will let you know more on price and dates. Which pedal do you fancy trying out.? Click on the image below for a bigger picture. 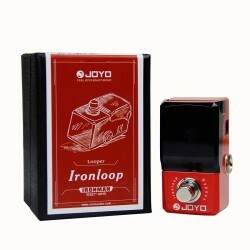 6 Comments To "A First Look New JOYO R Series Guitar Effect Pedals"
Hi Kevin - Yes the Ironman pedals are still in production, although possibly no more will be added to the series at this moment. Ask your local retailer to get in touch, we have a number of stores dotted about the UK who stock or can stock the JOYO for you to try out in store. thanks!